Singapore Slings, Peanuts and now Bentleys. I like going to Raffels. The tradition is to order the Singapore sling, which was invented there, eat peanuts, then through the shells over your shoulder onto the floor. It is totally acceptable behaviour, in fact it is encouraged! 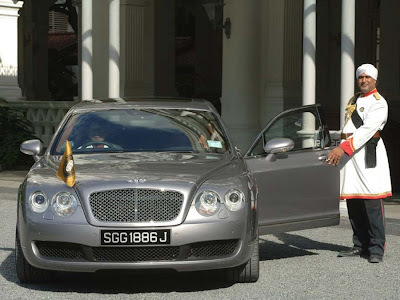 Now they have Bentley Flying Spurs to take you to Changi. Nice.